Hadi Jasim was an Iraqi translator for the US military. Now he’s a “global guide” at the Penn Museum in Philadelphia. As you know, I’m a fan of immigration and of welcoming refugees to this immigrant-built country. It’s not usually easy for immigrants once they get here. They are required to find a way to support themselves within a few months, and, if language is a barrier, they must learn English as soon as possible. Some immigrants start their own business. Some — even if they are highly skilled — take jobs that don’t need English. I know a Haitian immigrant who, for example, was a physician with years of experience who nevertheless took a kitchen job and was grateful to find work. Once in a while I read a story like the following, in which some wise boss or institution finds a really creative way to employ an immigrant. Emma Jacobs reports at Public Radio International (PRI), “At the University of Pennsylvania Museum of Archaeology and Anthropology, Moumena Saradar directs a group of visitors to a glass case containing an enormous gold headdress and beaded shirt — the burial garments of Queen Puabi, who died around 2550 BCE. They’re a highlight of the museum’s Middle East gallery, reopened in April after a $5 million renovation. “ ‘Queen Puabi’s burial jewelry is one of my favorite objects in the gallery,’ says Saradar, who goes on to explain that in Syria today, people still save up for gold jewelry for their wedding. She shows pictures of packed jewelry shops in Damascus, walls glittering from floor to ceiling. “Saradar is among the museum’s new tour guides — immigrants and refugees from Syria and Iraq who can make connections between the ancient artifacts and the present-day cultures. “As a guide, Saradar went through intensive training to prepare her to give detailed historical tours and respond to visitors’ questions. She says she practiced on her five children. “According to Kevin Schott, the Penn Museum’s education programs manager, Saradar and the other guides offer something local docents can’t. “These guides are expressly trained to weave their own personal stories and memories into their tours — things they would feel comfortable talking about over and over again. “Another guide, Hadi Jasim, spent his summers as a child at his grandfather’s house in southern Iraq, near the source of many of the objects in the gallery: the ruins of the ancient city of Ur. “Fresh out of college near the beginning of the Iraq War, Jasim became an interpreter for the US-led coalition forces in 2004. He went on to work for the UN in Iraq doing communications and anti-trafficking work. In 2017, he finally received permission to come to the United States on a Special Immigrant Visa for Iraqis who worked with the US military. “Now, Jasim has a job in food service at a local hospital. He says the museum work has become more than a second income. “Jasim will have more colleagues joining him at the museum in the future. The Penn Museum plans to hire guides for all of its global galleries.” More at PRI, here. I find many things to love about this story, but if I had to choose one thing, do you know what it would be? It would be the look on these two guides’ faces. A look of peace. 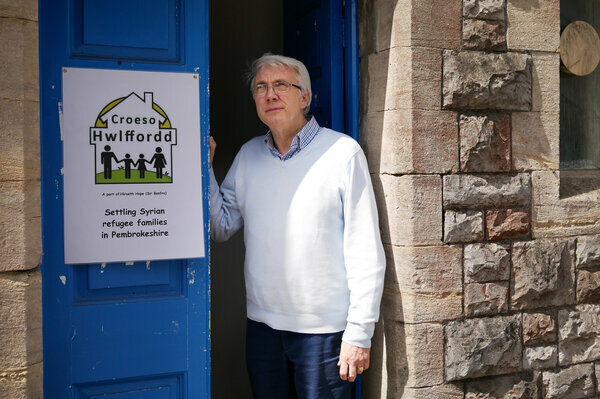 Jeff Britten stands in the doorway of the Baptist chapel in Haverfordwest, Wales, where he meets regularly with other members of his group sponsoring a refugee family. The name of the group is Croeso Hwlffordd, or Welcome Haverfordwest in Welsh. What can I say? There are kind people everywhere. This story is about the efforts of residents of a small village in Wales to welcome refugee families from Syria. It’s not necessarily an easy thing to do — there are so many differences in experience and culture. But these people knew it was the right thing to do. Daniella Cheslow writes at National Public Radio, “Back in February, Jeff Britten sent a description of Haverfordwest, his town of 13,000 people in southwestern Wales, to a family of Syrian refugees living in Jordan. “He hoped the family, whom he contacted with the help of the Home Office, which controls U.K. immigration, would come live in Wales. At that stage, he knew little about them, only that they were Syrians recognized as refugees by the United Nations. “The refugees have come to Wales as part of a community sponsorship program that began in the U.K. in 2016. A group of British citizens can commit to providing refugees help with housing, navigating schools and doctors, language and the job search. “In Haverfordwest, about 30 residents answered Britten’s call and signed up to sponsor the newcomers. … Jenny Blackmore had worked with Syrian refugees in the nearby town of Narberth and noticed that housing was often a stumbling block to fulfilling the government’s conditions. Landlords had to keep their homes open while the Home Office processed the resettlement application, and the government paid a lower rental rate than the market could offer. “Blackmore’s mother had recently died and left her an inheritance. She invested it in a three-bedroom, two-story rowhouse in the center of Haverfordwest, with the aim of housing a refugee family. Characters from the Afghan Sesame Street. 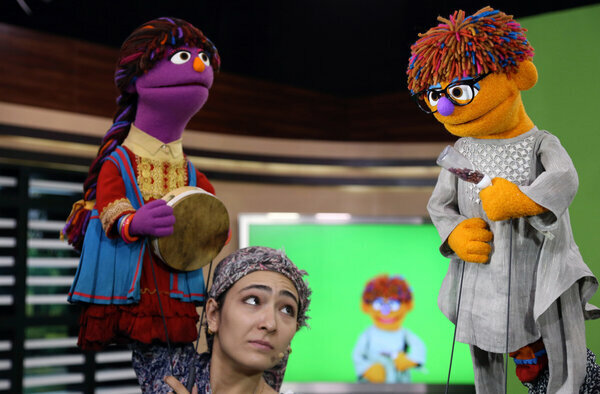 A MacArthur Foundation grant will enable the Sesame Workshop and the International Rescue Committee to roll out a version for Syrian refugee children. Even if they make it to relative safety, children often suffer the most from wars and dislocation. In addition to the trauma, there is the problem of education, which is unavailable or spotty in refugee camps. That is why people of goodwill are reaching out with programs that can both comfort and teach. Jason Beaubien reports on one example at National Public Radio. “The MacArthur Foundation will give $100 million to Elmo, Big Bird and their buddies to massively scale up early childhood development programs for Syrian refugees. “It will be distributed over traditional television channels, the internet and mobile phones. It will also serve as an educational curriculum for childcare centers, health clinics and outreach workers visiting the shelters where refugees live. The workers will deliver books to kids and caregivers. Photo: Diego Ibarra Sanchez for The New York Times. Ali Shehadeh, a plant conservationist from Syria who fled the war in his country, at work in Terbol, Lebanon. The harm that wars do seems endless. Every aspect of life is affected. And yet, against all odds, good people rise up to save or try to reconstruct what might be lost. In this post, everyday heroes protect a seed bank from the war in Syria. Somini Sengupta has the story at the New York Times. “Ali Shehadeh, a seed hunter, opened the folders with the greatest of care. Inside each was a carefully dried and pressed seed pod: a sweet clover from Egypt, a wild wheat found only in northern Syria, an ancient variety of bread wheat. “He had thousands of these folders stacked neatly in a windowless office, a precious herbarium, containing seeds foraged from across the hot, arid and increasingly inhospitable region known as the Fertile Crescent, the birthplace of farming. “Shehadeh is a plant conservationist from Syria. He hunts for the genes contained in the seeds we plant today and what he calls their ‘wild relatives’ from long ago. His goal is to safeguard those seeds that may be hardy enough to feed us in the future, when many more parts of the world could become as hot, arid and inhospitable as it is here. 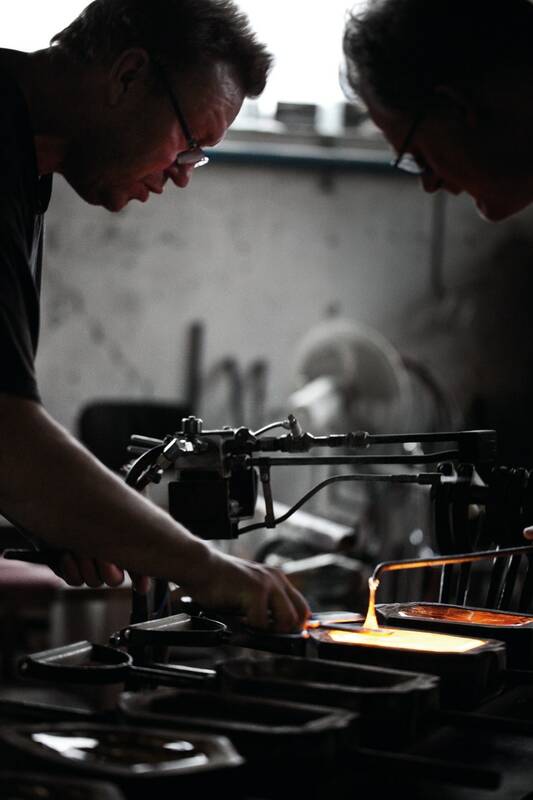 “But searching for seeds that can endure the perils of a hotter planet has not been easy. 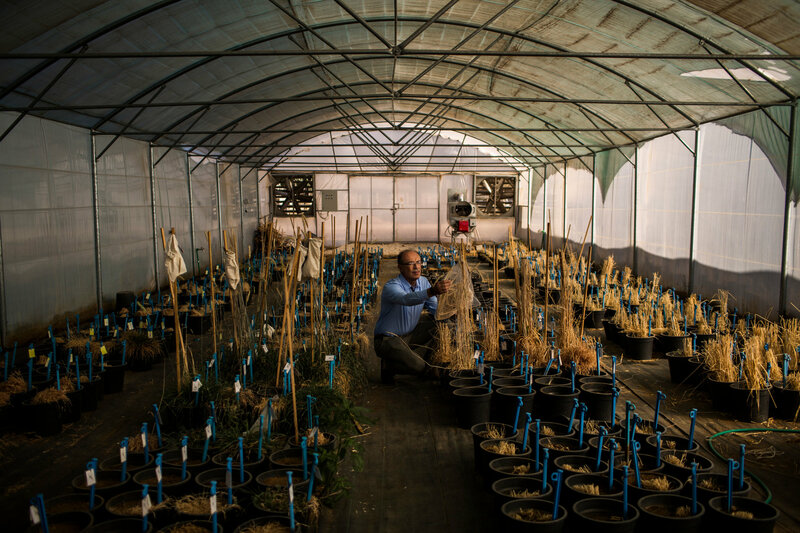 It has thrown Shehadeh and his organization, the International Center for Agricultural Research in the Dry Areas, squarely at a messy intersection of food, weather, and war. “By 2014, the fighting drew closer to its headquarters in Aleppo and its sprawling field station in nearby Tal Hadya. “Trucks were stolen. Generators vanished. Most of the fat-tailed Awassi sheep, bred to produce more milk and require less water, were stolen and killed for food. … And the center’s most vital project — a seed bank containing 155,000 varieties of the region’s main crops, a sort of agricultural archive of the Fertile Crescent — faced extinction. “But researchers there had a backup copy. Beginning in 2008, long before the war, the center had begun to send seed samples — ‘accessions’ as they are called — to the Svalbard Global Seed Vault, the ‘doomsday vault,’ burrowed into the side of a mountain on a Norwegian island above the Arctic Circle. It was standard procedure, in case anything happened. “Mr. Shehadeh … is obsessed with the wild relatives of the seeds that most farmers plant today. He eschews genetically modified seeds. He wants instead to tap the riches of those wild ancestors, which are often hardy and better adapted to harsh climates. ‘They’re the good stock,’ he said. The experts believe that the seeds from plants that thrive in this arid part of the world will be needed for feeding the planet as it warms. I learned about Open Doors for Refugees from my friend Anne, who for many months helped me guest blog at the Providence Granola Project. I miss her so much. She died a couple weeks ago in a freak biking accident. From now on, whenever I post about refugees, I will think of Anne. This refugee-outreach story comes from the Wisconsin State Journal. Samara Kalk Derby writes, “Raphael Al Rubaye left Iraq for Madison eight months ago with his wife and two young daughters and has found a welcoming community here. “He served with the U.S. Army in Iraq for six years in the American-led war against al-Qaida and the Taliban. He was brought to this country by Lutheran Social Services and now works as a case manager for the organization, helping in the resettlement of other refugees. “It all started when she got the book ‘Soup for Syria: Recipes to Celebrate our Shared Humanity,’ and began making soup for her monthly lunches at [a business and community space she founded]. She would dedicate the meal to the welfare of Syrian refugees. “She soon realized she needed to do more and began bringing in speakers and holding discussion circles. During those discussions, Livny asked people about their feelings. ‘How can we sit back when this is happening?’ she said.” More here. People certainly bond over food. That is one reason the Providence Granola Project got into food as a way to give some refugees US workforce skills. I mentioned several refugee-based food businesses in a June post I wrote for the Providence Granola Project here. 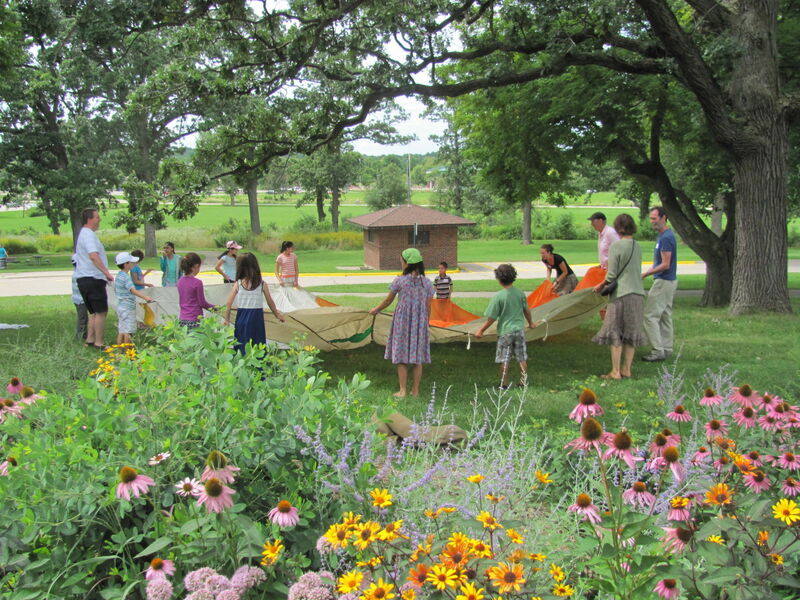 Parachute game at Sunday picnic hosted by Open Doors for Refugees in Olin Park, Madison, Wisconsin.